I love trying out new color combinations, they help breathe fresh air into my stamping! 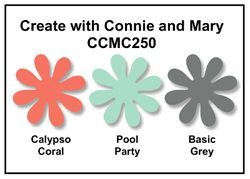 Once again I played along with the color challenge over at www.createwithconnieandmary.com. What fun colors to play with! I LOVE the big blossom from Betsy's Blossoms. It's just a great image that can be made into a focal point, or awesome background like I did here. Doesn't it look like Designer Series Paper? I also used White Craft Ink and stamped the leaf from that set as well onto my Basic Gray card stock to give that a little interest. Just a fun overall card! Happy Stamping!